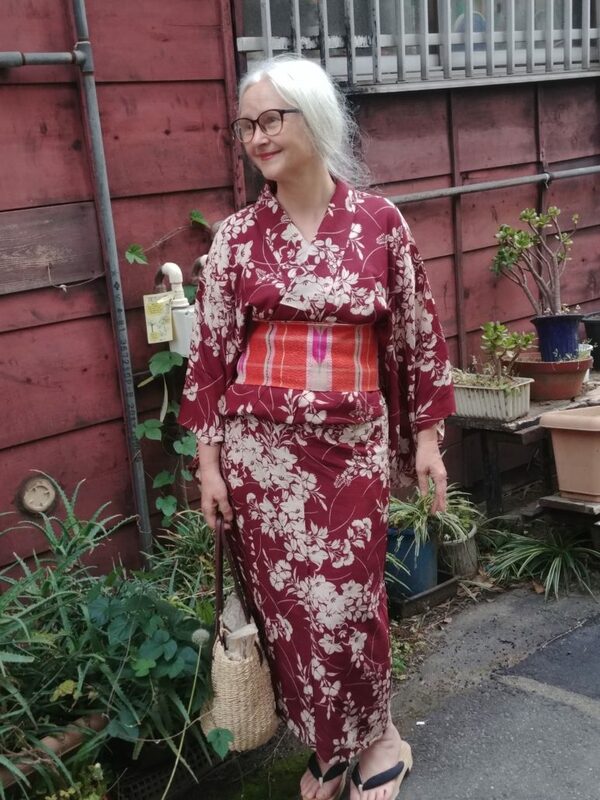 Ever since I spent three years in the Tokyo suburbs while beginning my kimono studies in the mid-80’s I’ve always wondered what it would be like to live in a neighborhood in old, downtown Tokyo. I happened on a quiet area I loved while visiting in January and through persistence was able to take up residence in a share house in Nezu this May. The quiet lane in the shitamachi district suited me well. 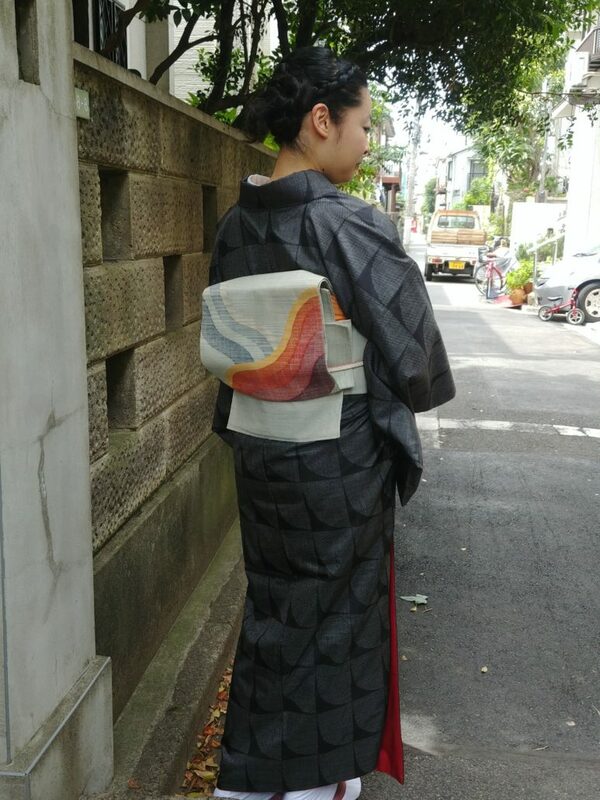 I wanted to explore the social aspect of kimono and expand my historic knowledge. 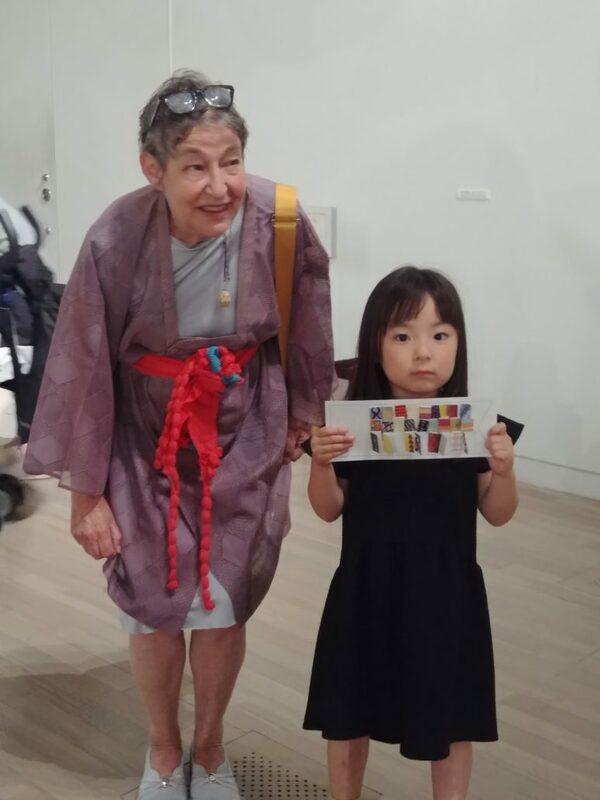 I often dressed with some vintage fabric in the mix and did not disguise my appreciation and curiosity. 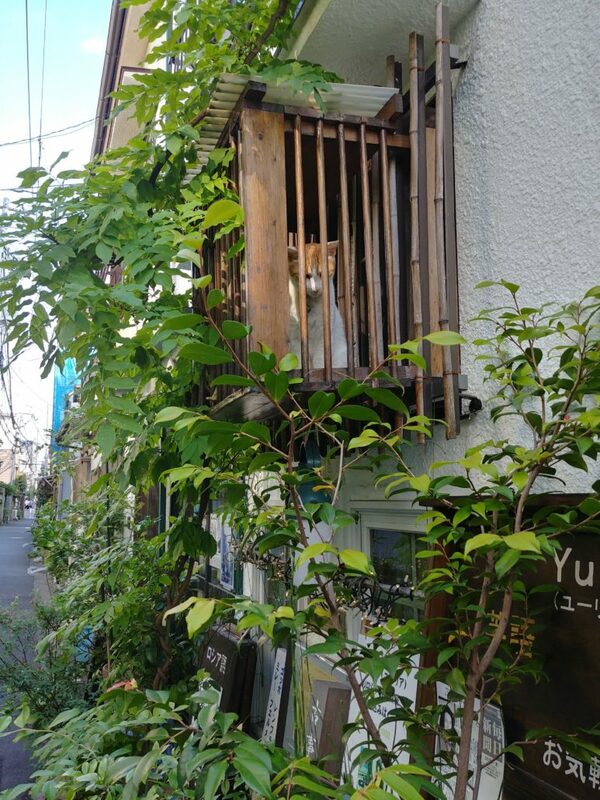 The neighbors were friendly, notwithstanding my pidgin Japanese. 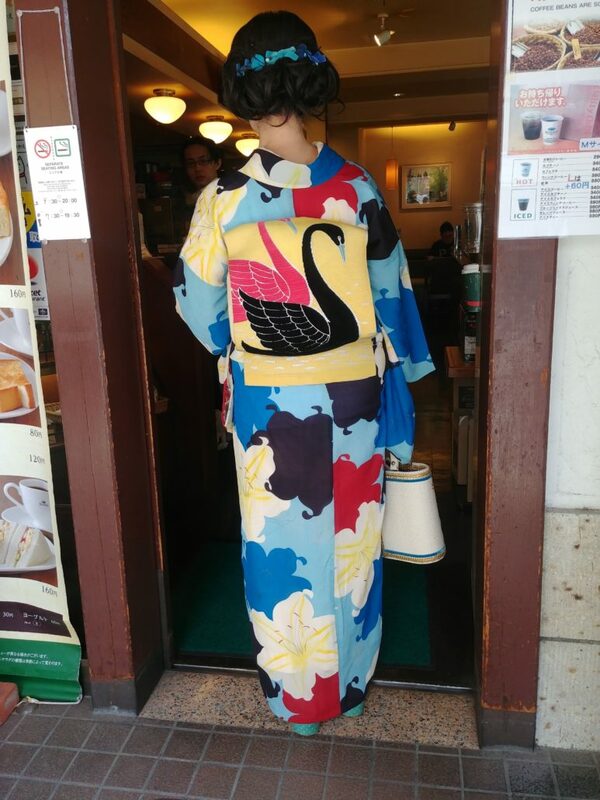 Few people are still wearing kimono on a daily basis now, but I caught a few here and there. This lady was on her way to a program of traditional dance. 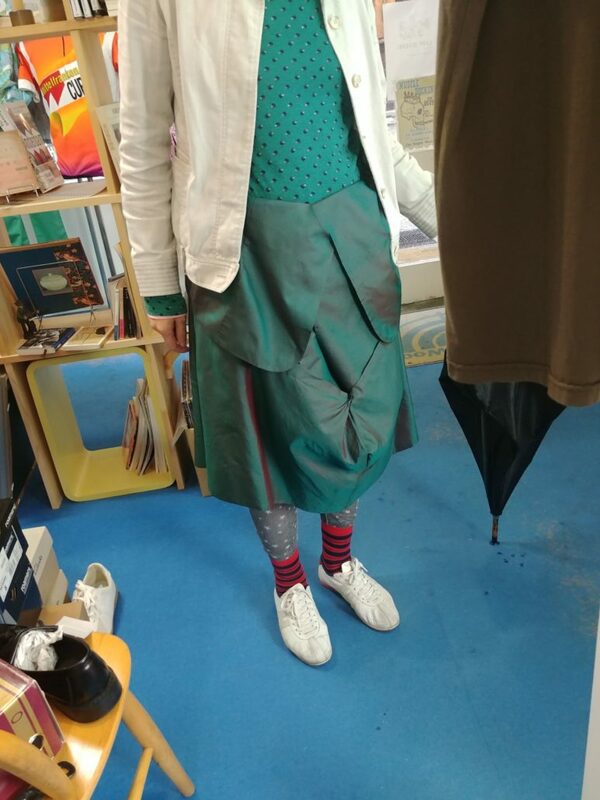 I sometimes ran across clients of the beautifully edited vintage shop called Ponia. 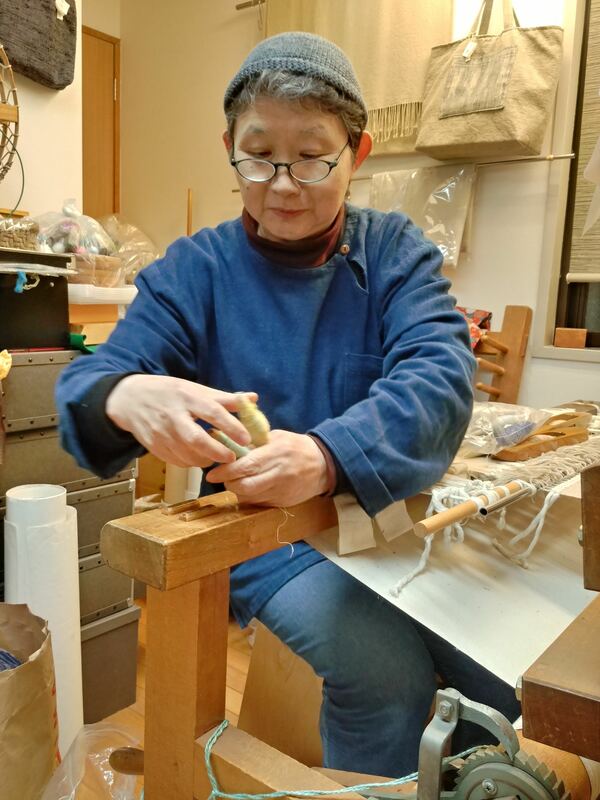 And I had some lessons with a local weaver, Mitsui Yoskiko, a transplant from Nagano. 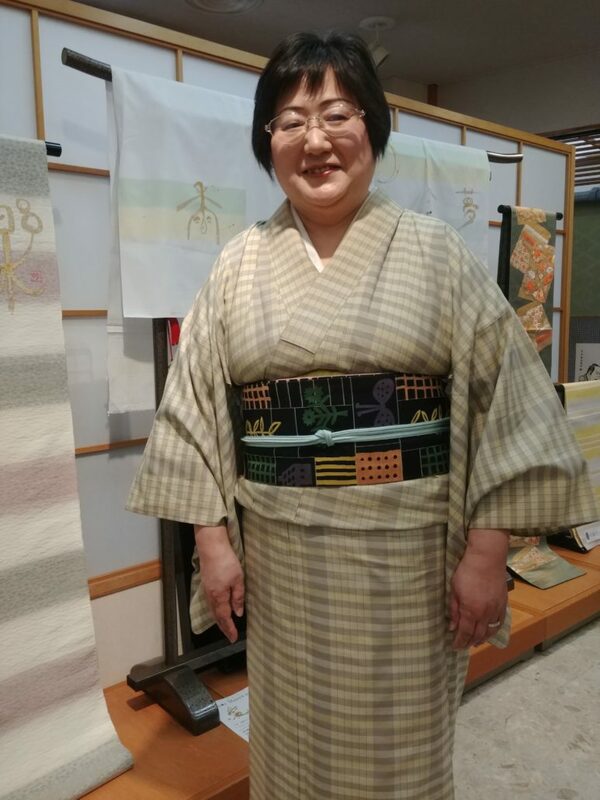 She was happy to explain the original meaning of “tsumugi” yarn ( an untwisted silk floss which retains its loft when woven) and show me her natural dye ingredients. 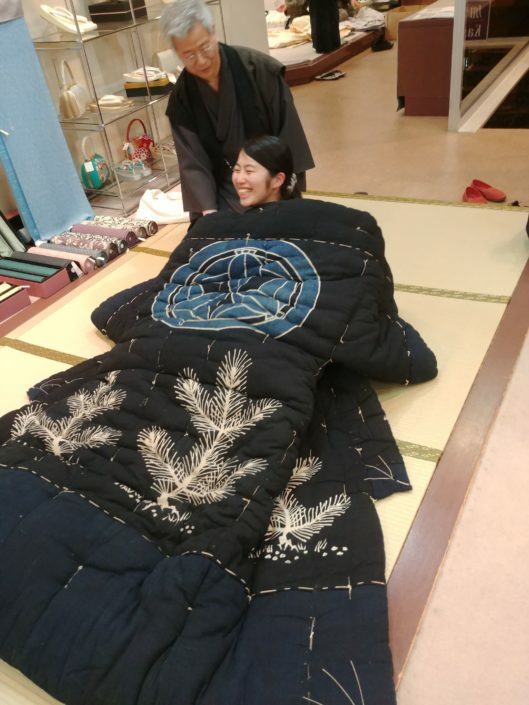 The subject of Japanese textiles is literally part of the fabric of Japanese life, right along with the other traditional crafts like basketry and ceramics. 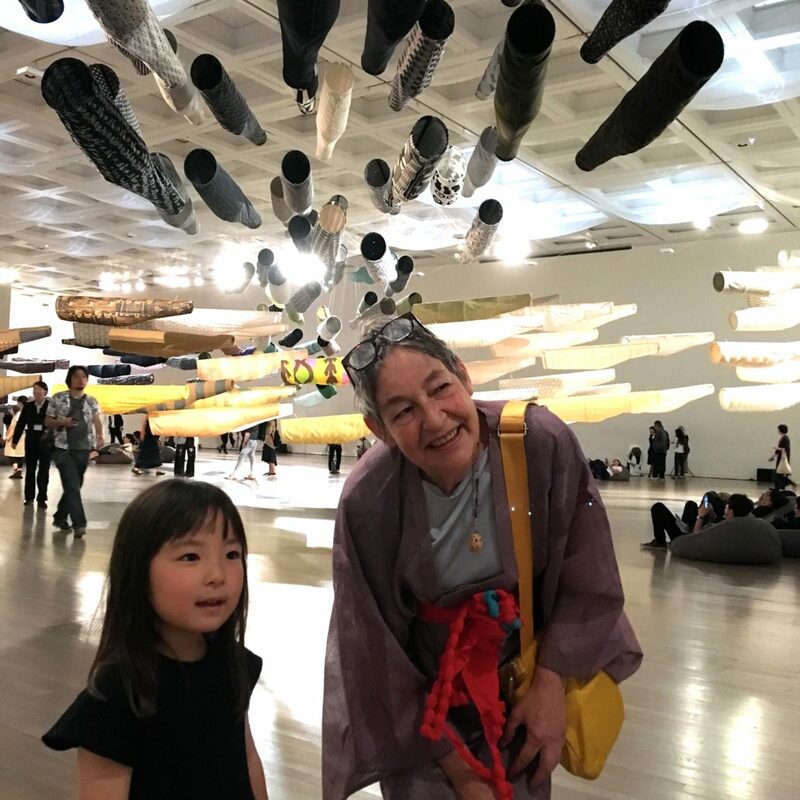 Following in the history of governmental support for the important economic benefits of the textile industry, Living National Treasure artists continue to be chosen and supported. Contemporary innovation continues apace. 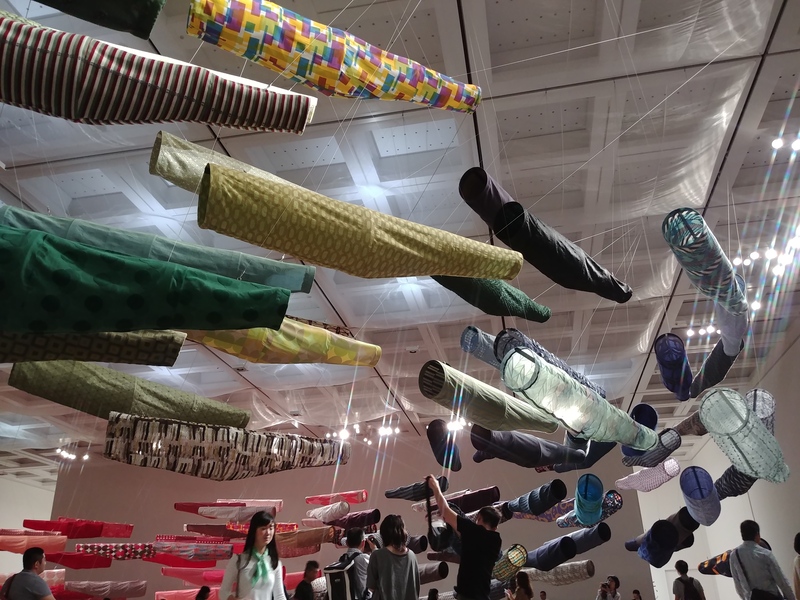 I attended the opening of Reiko Sudo’s installation at The National Museum of Contemporary Art during the trendy Roppongi Arts Weekend. 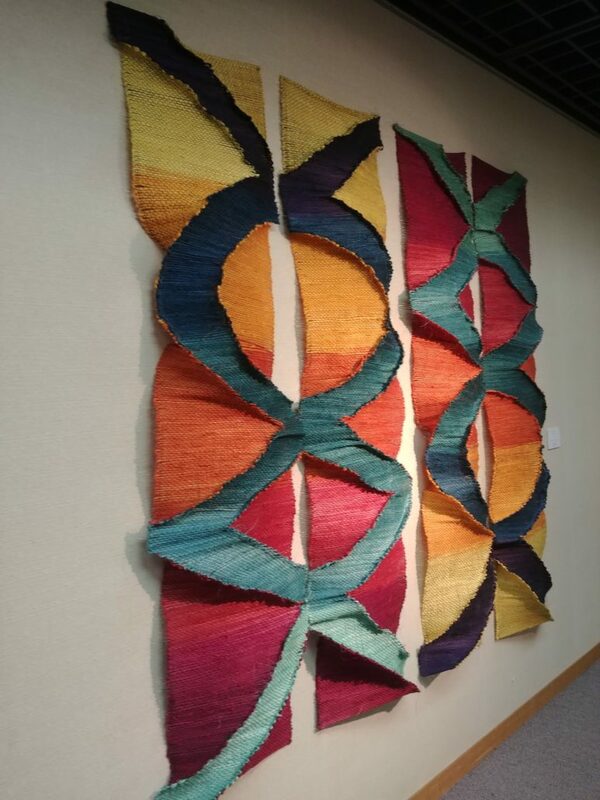 In Kyoto, new art weavings were being exhibited, too. 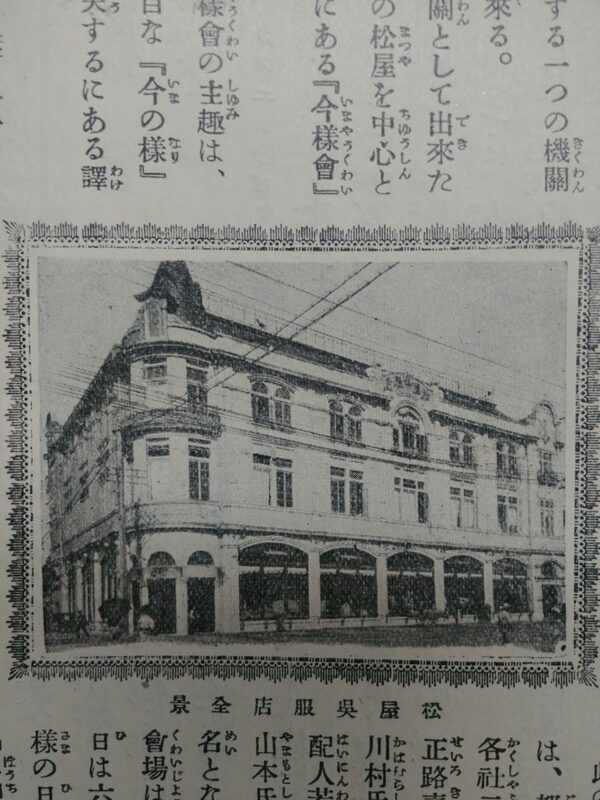 Of course, I love old photos, too. 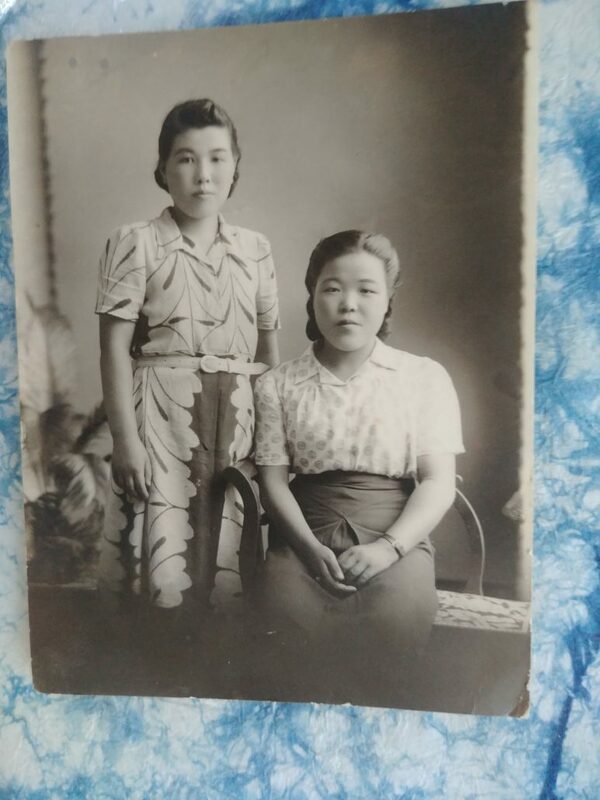 These sisters captured just at the transition to “modern” times (early Showa?) caught my eye. 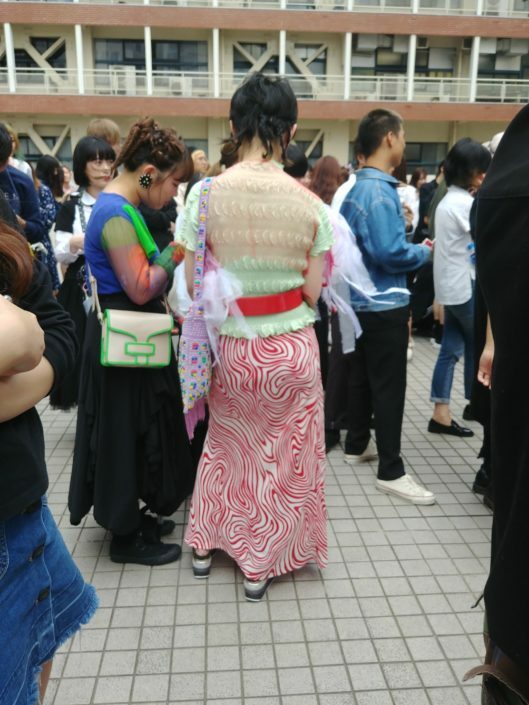 Love the mix of patterns! 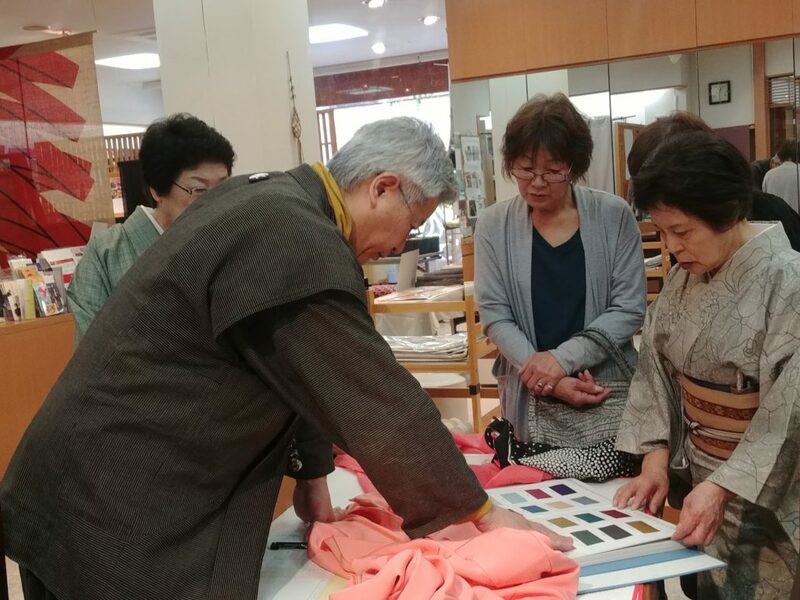 “Business is difficult.” Hi-end kimono retailers have been saying this for a while, but by listening well to their clients they continue to seduce with the new designs they source so carefully for their custom orders. 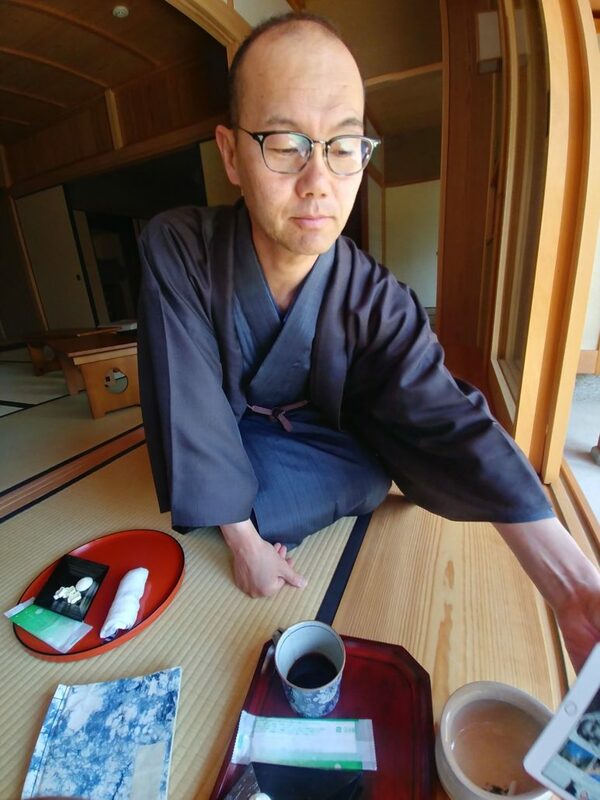 My old friend, Koji Nishmune at Orimoto (near Osaka) regaled me at his new teahouse as well as his impeccable shop. 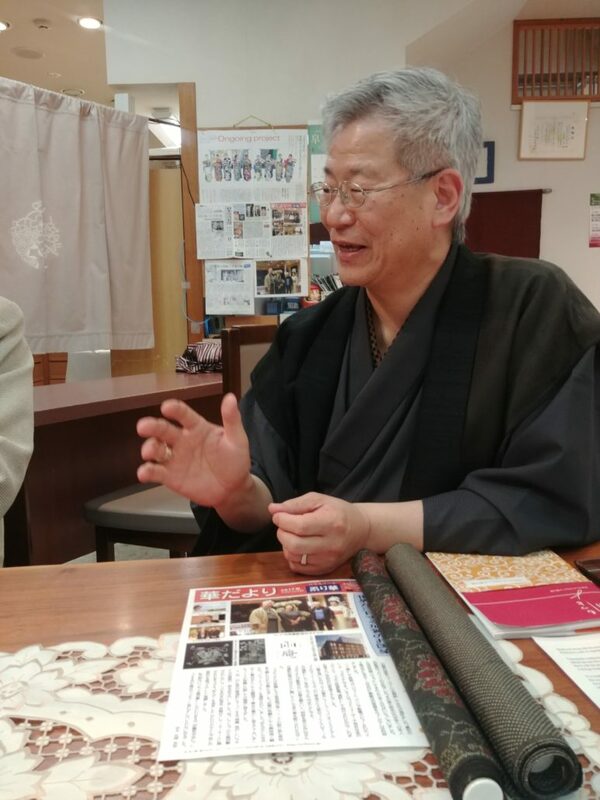 For my first ever visit to Kanazawa, Koji introduced me to the owners of Erihana, Hiroshi & Keiko Hanaoka. 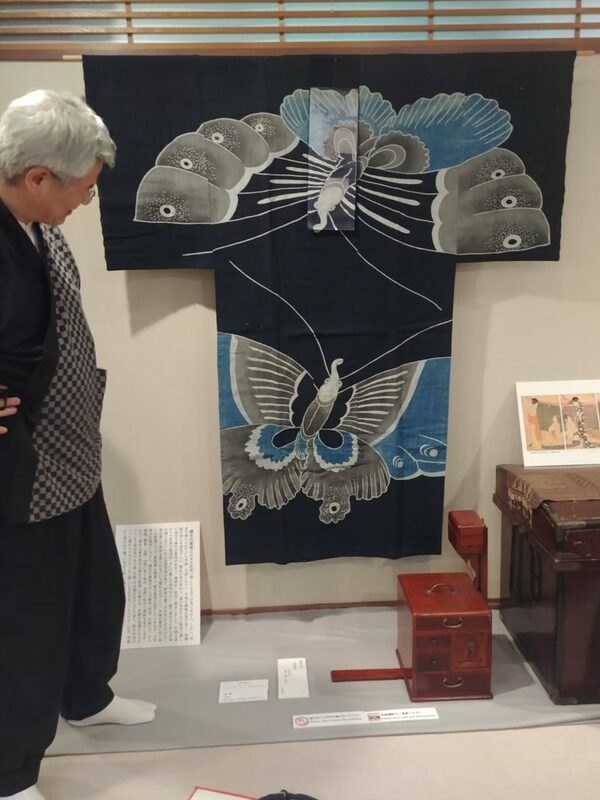 Over four days we enjoyed lively conversations and demonstrations drawn from the deep collection of indigo-dyed cottons from the Meiji-era local communities as well as the clever new offerings from their commissions. I found the city nicely balanced between old and modern. I think a lot lately about the future of the many twentieth-century kimono which have been lovingly tended, mended and kept in family. 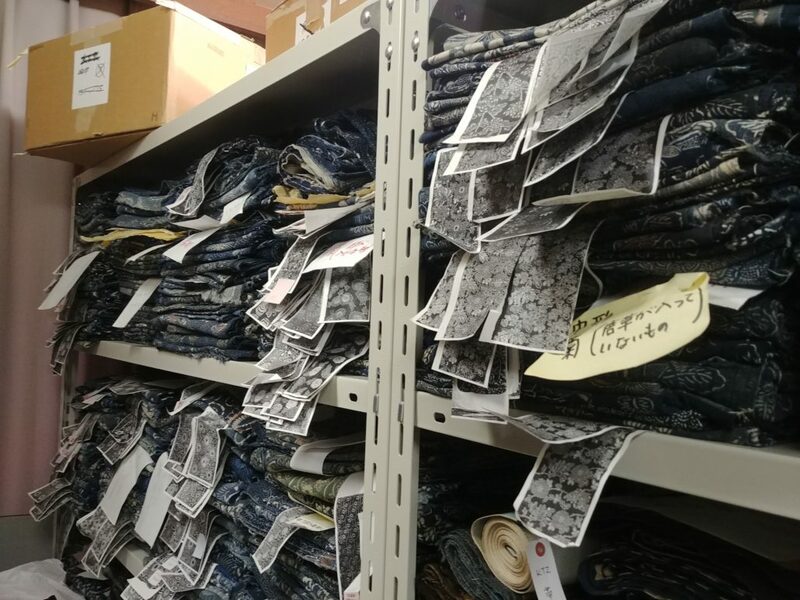 There’s an emotional tie to these garments which creates a dilemma for the inheritor: where should these treasures go next? 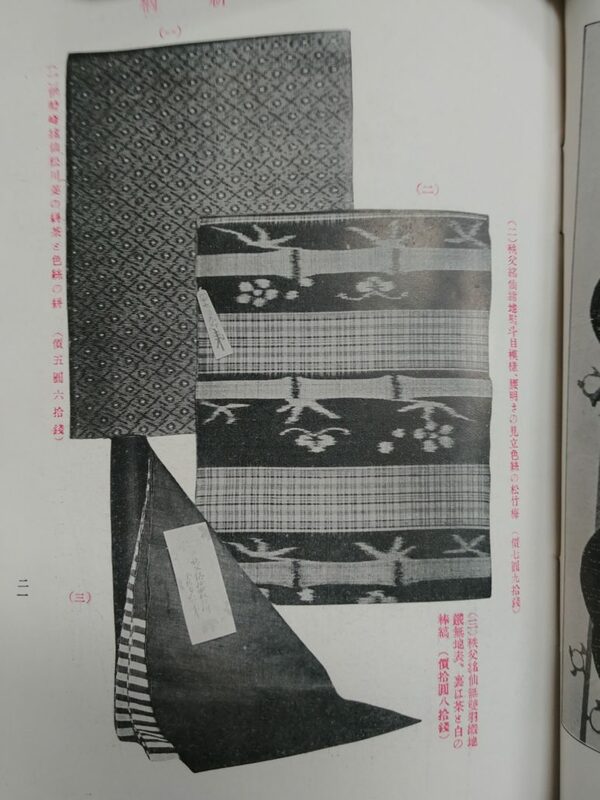 Vintage indigo and white cotton kasuri, originally made for farmwear, is often collected and made into dresses or smocks for older urban ladies, but this accounts for only a small part of the sturdy/or beautiful fabrics which could be re-fashioned. 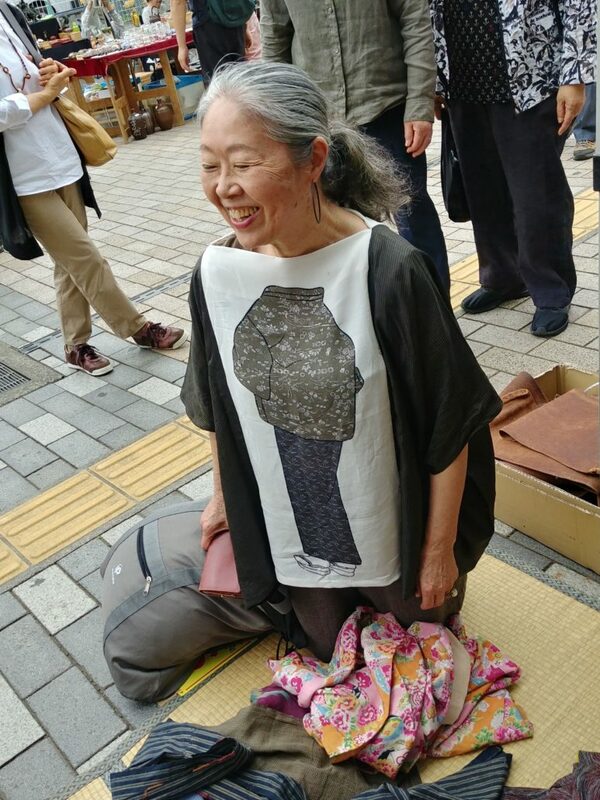 This lovely creator attracted lots of attention at a market near Yokohama. 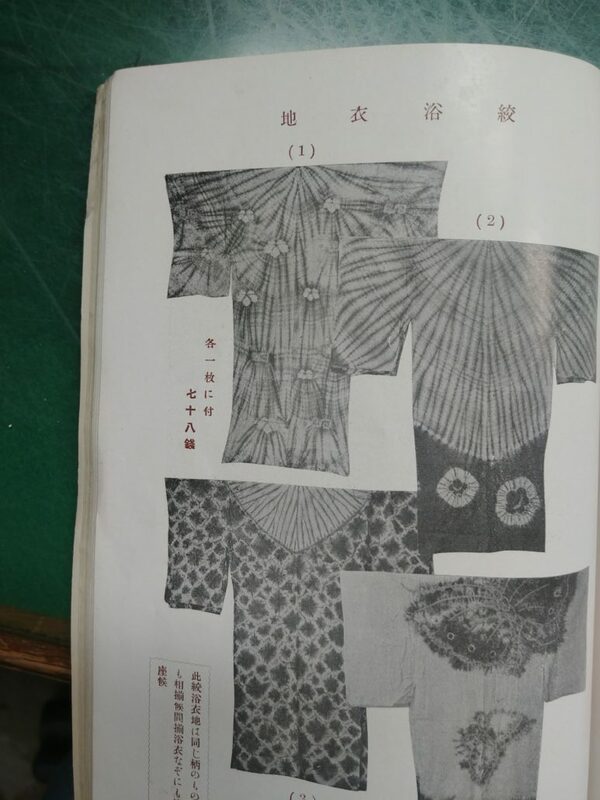 Her simple shirt features a cut from an unusual sample roll displaying kimono fabric patterns. 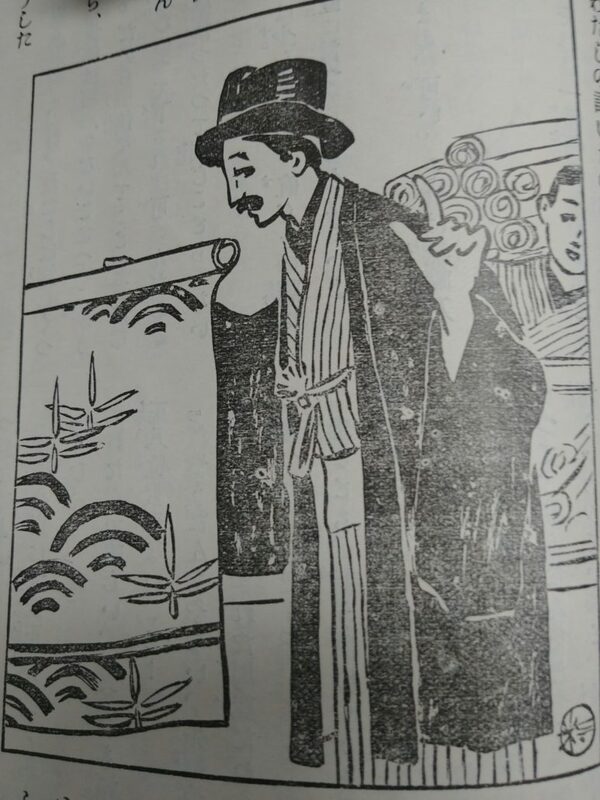 The configuration was printed so that the retailer could hold it below the chin of the client and she could “imagine” what that choice would look like on her. 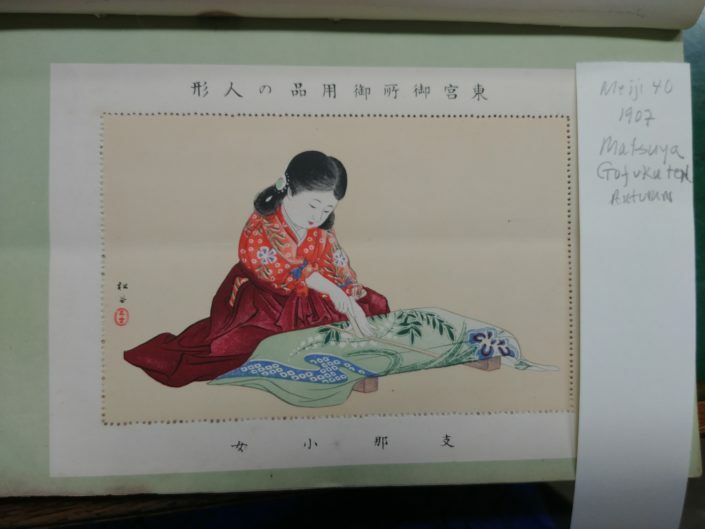 (The order would then be submitted for a whole roll from the maker.) Very striking, I thought, as I did a double-take, used to seeing so many T-shirts with designs across the same area. 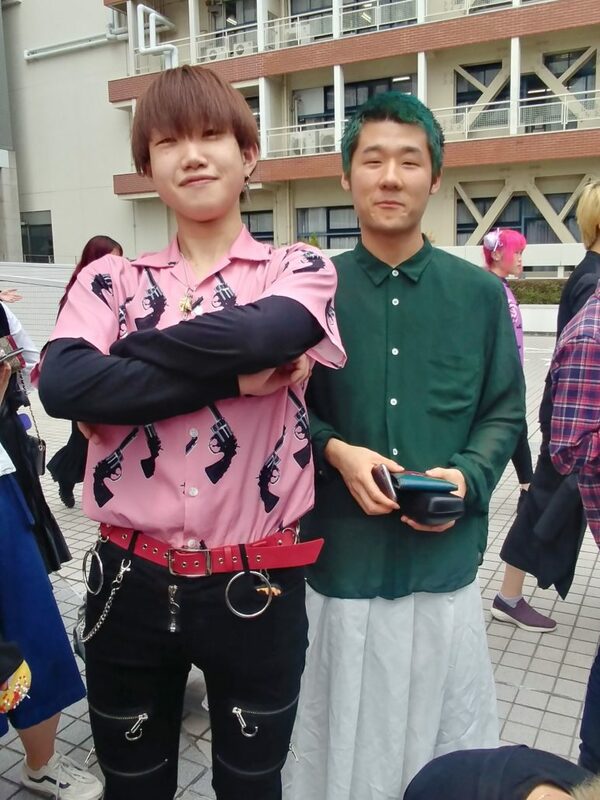 Bunka Gakuen is a large fashion university in Tokyo with several colleges and approximately 6000 students. 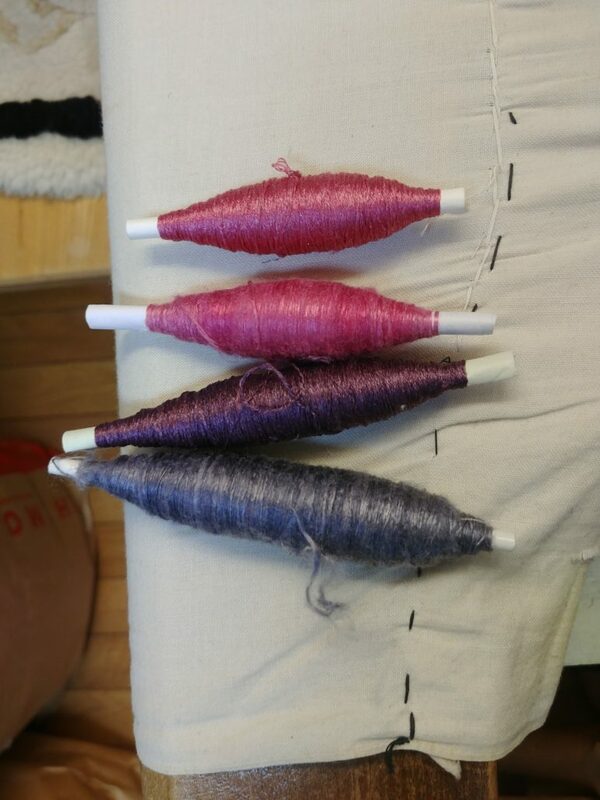 When I visited for the day hosted by the Fabric Resource Department our conversations ranged widely. 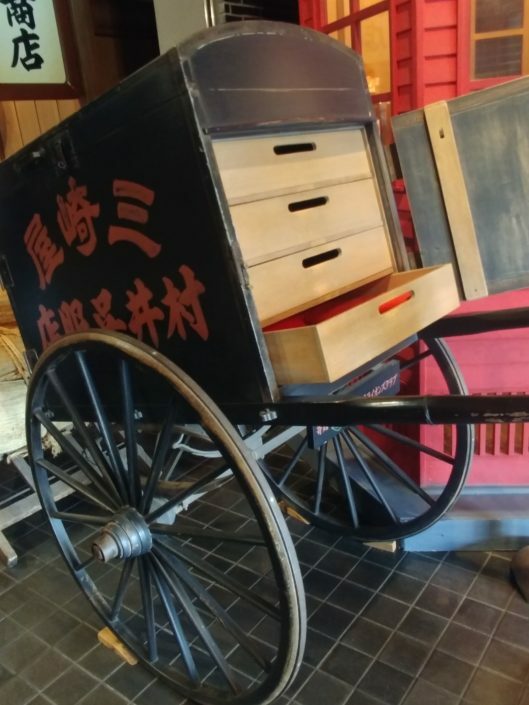 Quite separate from the museum (closed for refurbishment), their study collections available to students consist of well-organized fabrics from the past 30 years and lovely designer clothes, but no vintage goods from Japan. 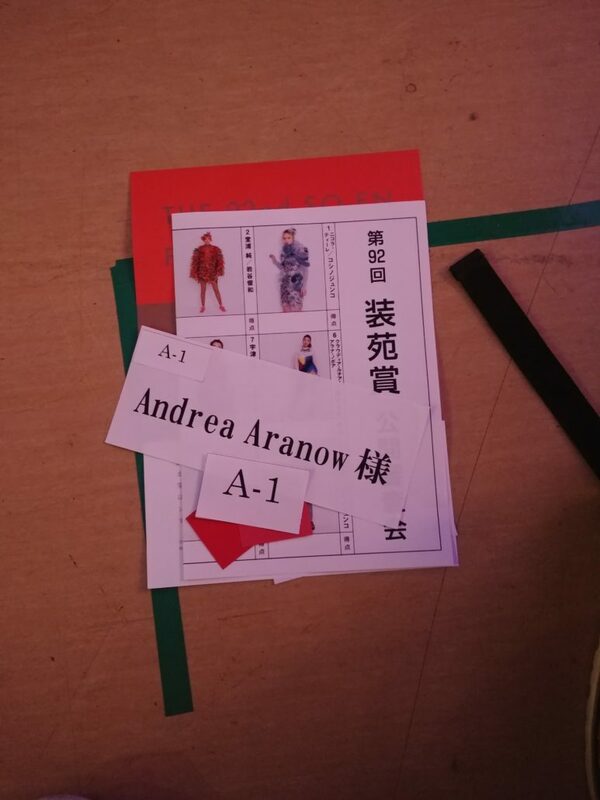 By a stroke of luck, I was then invited to the catwalk finals of a young designers’ competition sponsored by Soen magazine a few days later. 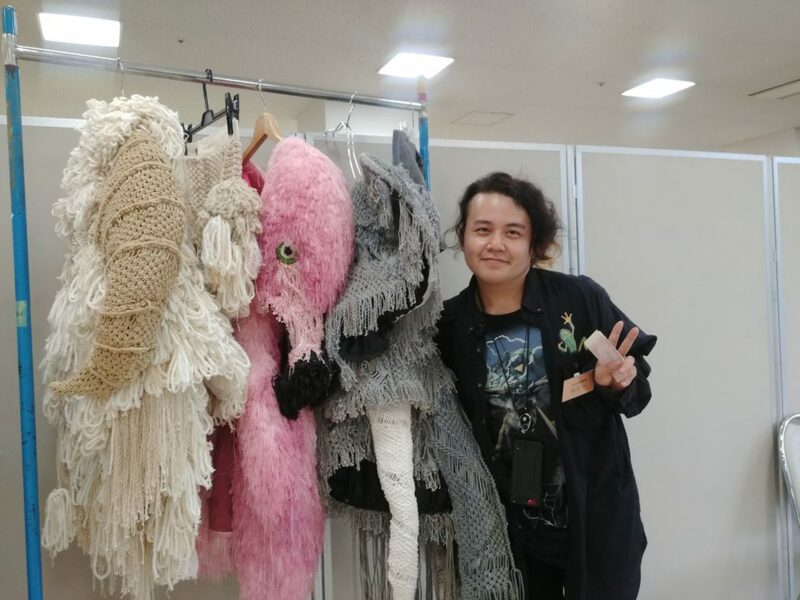 who explained that his four cats were his inspiration for the ram, flamingos, and elephant costumes because he felt that humans are making too many mistakes while imposing their politics, architecture, etc. and that more attention should be paid to the wisdom of animals. Lots to think about, back now in New York. 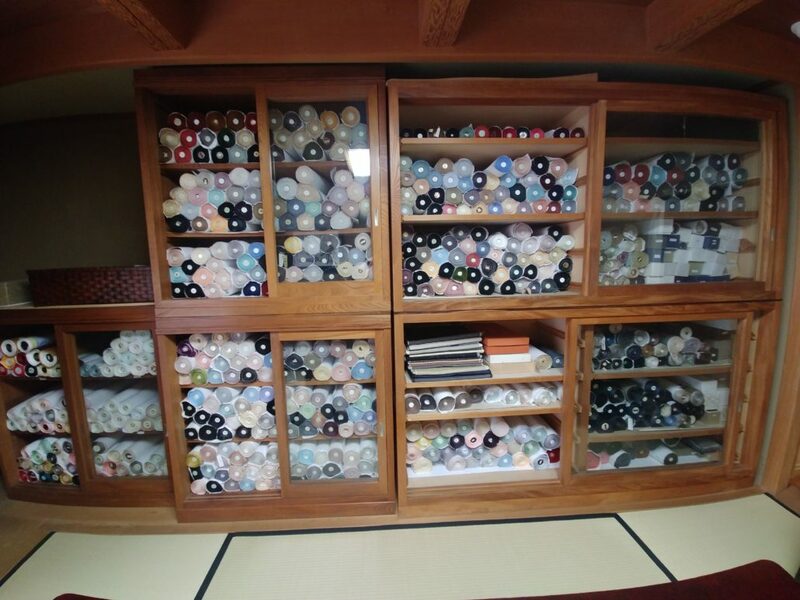 And this is just the textile part of my stay in Japan. I'll use this space to share a few adventures with textiles: real or only inklings so far, remembered or projected. 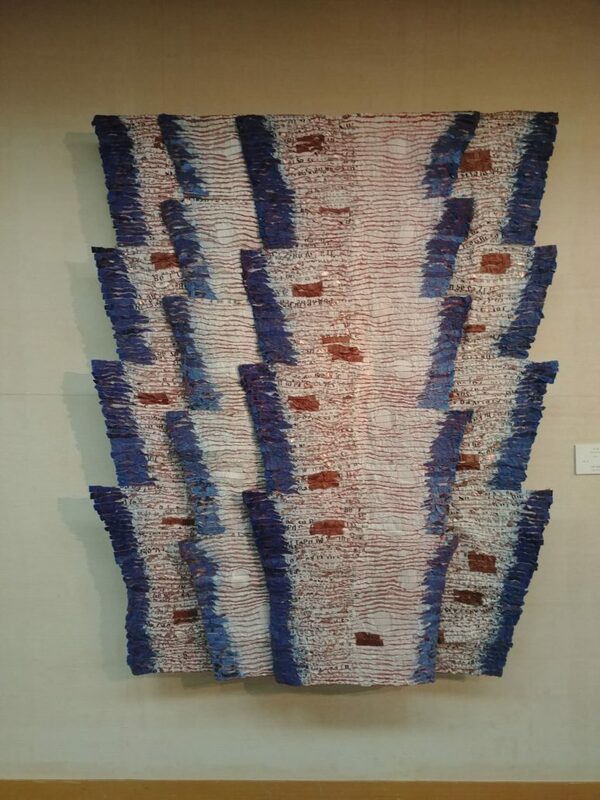 My swim through the world of textiles continues.